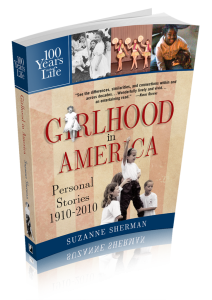 Girlhood through the 20th century is showcased in 100 Years in the Life of an American Girl, with 56 first-person stories about girlhood as it was in every decade between 1910 and 2010. Share your thoughts with me about 100 Years in the Life of an American Girl. Did you learn from the stories, maybe something about your own childhood or about your mother’s or grandmother’s early lives in the decades before you were born? Did you remember details of your own girlhood that you had forgotten? What surprised you? What touched you? What opened your eyes to something you hadn’t known about before? With your permission, your comments may be published on the site. I’m available for interviews about this book on American girlhood through the 20th century, and for interviews with book bloggers and online and print publications. I’m also happy to do a book reading or to speak at your event. Be in touch!